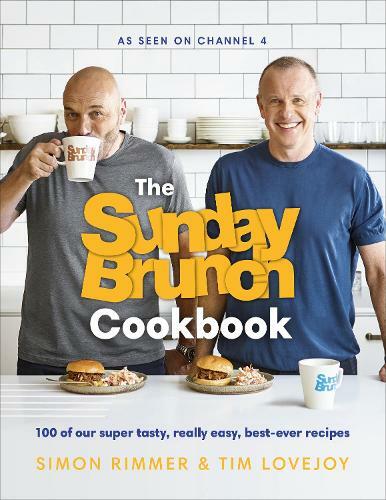 Make every day feel like the weekend with the first official cookbook from Channel 4's Sunday Brunch. Cheers Tim! Cheers Simon! Enjoy 100 delicious, fuss-free and easy recipes from your favourite weekend food and chat show. Find quick and easy mid-week meals, simple slow cooking, and dinners you can get on the table in under 30-minutes. Make lazy breakfasts and brunches, roasts, curries, bbqs and delicious sharing plates for the whole family or to share with friends. And don't forget about pudding and drinkipoos! Discover proper home comforts and your new family favourites in this gorgeous new cookbook. Includes brand new dishes as well as popular recipes from the show, such as: Sweet & Sour Crispy Fish Bites, Korean Sticky Pork Belly, Filthy Dirty Ham & Cheese Toastie, Blueberry Pancakes with Eggs & Bacon, Moroccan Carrot & Avocado Salad, Rump Steak with Kale Salad, San Francisco Fish Stew, Chilli Aubergines with Smoked Feta, Chicken Katsu Curry Burger, Mushroom Puri, Salted Popcorn Brownies, Strawberry, Watermelon & Rose Jelly Mousse AND MORE!